Tensions are mounting in Pakistan, the 200 million strong nuclear nation, which saw the second day of violent protests in its major cities as Islamist parties called for the judges who acquitted a Christian woman of blasphemy against their religion, to be killed. Roads leading to all major cities were blocked as more and more Islamist extremists called to rise up against the injustice they’ve experienced. In certain areas, the army was called in to restore order. Newly elected Prime Minister Imran Khan appeared in a nationwide address and urged the Islamist parties do not "test the patience of the state." "We will not allow any damages. We will not allow traffic to be blocked," Mr. Khan said. "I appeal to you, do not push the state to the extent that it is forced to take action." To give you an idea of the seriousness of the situation, Pakistani authorities deployed troops to guard state buildings in major cities and in the city of Lahore, the government decided to suspend mobile signals and internet connections. Many schools in the three major cities Karachi, Lahore, and Islamabad remained closed after a major Islamist leader had called for the Supreme Court judges to be killed. Supporters of the extremists Tehreek-e-Labaik Pakistan (TLP) party blocked 10 roads around Pakistan's biggest city, Karachi, several others outside Lahore and one major entry to the capital Islamabad. TLP co-founder Muhammad Afzal Qadri called upon the household staff of the judges to help them murder the ‘unholy ones,’ stating: "all three deserve to be killed." "Either their security, their driver or their cook should kill them." 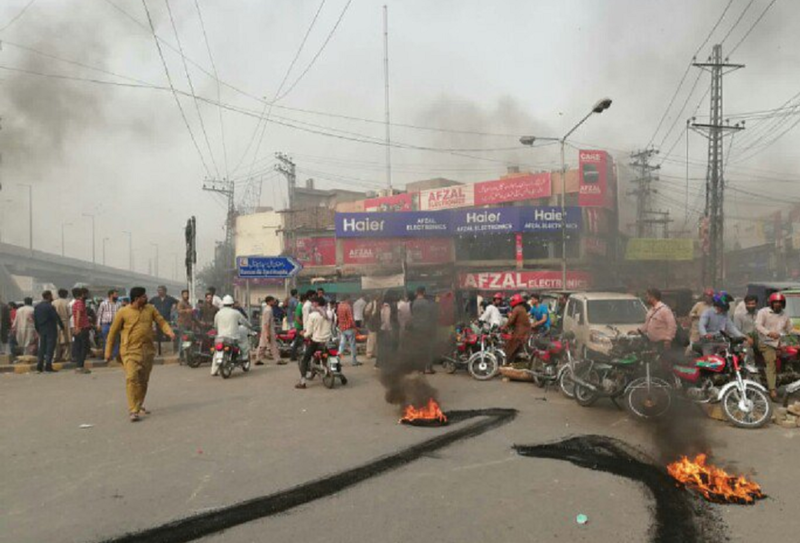 Related coverage: <a href="http://thegoldwater.com/news/40892-Pakistan-Violent-Religious-Protests-Erupt-As-Supreme-Court-Clears-Christian-Blasphemy-Video"> Pakistan - Violent Religious Protests Erupt As Supreme Court Clears Christian Blasphemy (Video)</a>. The Christian woman about whom the commotion is all about, Ms. Asia Bibi, is set to leave the country. Her paperwork is being processed as quickly as possible. France and Spain have agreed to offer her asylum. That country has been doomed by Islam, I can't see any way to a functioning democracy. This is what HRC & the Dimms almost brought to America. This is what they still want. I lost all hope in the democratic party long ago. I have been registered Independent ever since. I always studied & voted for those I felt where most "good at heart" for us the voters vs. themselves/special interest groups. This election please ask yourself… "Do I want to live in continuous fear of attack, if I do not believe as they do?" OR… "I do see that so far DJT has helped, not hindered American`s & the Country as a whole". Well they truly, would only have the vote of the criminals, the deviants & the deceased. You can't control people who were born to kill. If it isn't their religion or politics, which is the same they will find another reason because they enjoy the slaughter and get a high out of the pleasure of it. Hey Forbin, if that is true & not the opposite… Well hell either way really. These sub-animals would do as they pleased to you & then smile while you pleaded, whimpered or screamed. Stop being so simpleminded #40987. Remember even the dumbest animals posses common sense.